No bake squash or pumpkin cheesecake made with homemade Greek yogurt cream cheese can be a very healthy and rewarding dessert to add to your holiday menu. By making your own squash puree & Greek yogurt cream cheese (instructions below), you can drastically cut down calories, increase protein & feel good about the quality of ingredients you are using. I recommend you start by making the cream cheese and squash puree at least the night before. In a small bowl combine cookie crumbs and melted butter, mix until evenly coated. Press into the bottom of 6 jars or glasses. In a separate mixing bowl, beat the cream cheese until fluffy. Add the honey or maple syrup, vanilla, cinnamon, nutmeg, ginger, cloves and salt and beat for 2 minutes. Add the squash/pumpkin puree and beat until blended. Taste for level of sweetness & add more honey or maple syrup if needed. Beat to incorporate. Divide cheesecake mix between the 6 glasses. Put a metal mixing bowl and your beaters into the freezer for five minutes to get very cold. Pour the heavy cream & maple syrup into the mixing bowl. Beat on whipped (usually highest setting) until the cream begins to form soft peaks and has nearly doubled in size. Top the cheesecakes with whipped cream. To garnish, shake maple sugar on top or fresh ground cinnamon or nutmeg. Chill until ready to serve. May keep refrigerated for up to 48 hours. Use a meaty, rich, full flavored squash such as a Seminole, Red Kuri, Buttercup, Butternut or your favorite variety of pumpkin. Roast squash. I roast mine whole then cut it open & scoop out the seeds because I’m lazy but you can also cut your squash in half, remove the seeds & roast. Roast until you can easily pierce the squash with a fork. Let cool slightly then scoop the flesh out. Puree using a food processor or blender. Place cheesecloth into a fine mesh strainer, place over a bowl & pour the pureed squash into the strainer. Cover & let the excess moisture drain out. If you have extra this freezes very well & can be used for lots of recipes. Line a fine mesh strainer with multiple layers of cheesecloth. Pour in approximately 1.5 to 2 times as much yogurt as the amount of cream cheese required for the recipe. Cover and let the whey strain out until it reaches the consistency of cream cheese. This can take up to 24 hours. 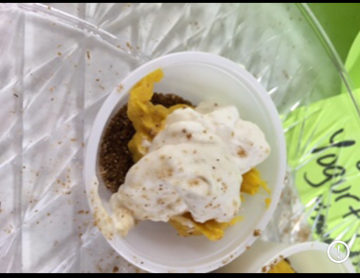 Adapted recipe for sampling at Iowa Food Cooperative. Use whole milk Greek yogurt, substitute sweetener & don’t use crust for Keto friendly version.